Callum’s Caravan provided short breaks in a fully accessible caravan at Haggerstone Castle, a holiday village near Berwick upon Tweed, for people with profound and multiple learning disabilities and their families/carers. 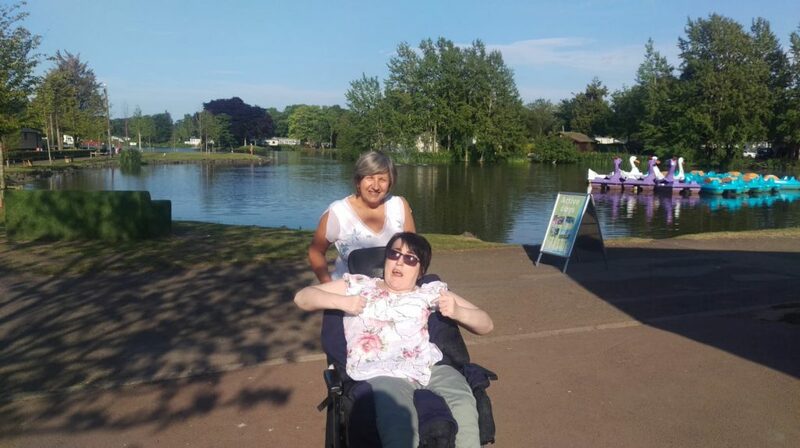 We established short breaks for people with profound and multiple learning disabilities and their families to stay at a fully accessible caravan in Haggerstone Castle holiday village, Berwick-upon- Tweed. There were 22 short breaks from March – November, supporting 22 people with profound and multiple learning difficulties and 46 family members to have an accessible and inclusive holiday. In addition 3 family carers had respite at home while their son or daughter had a holiday with paid carers. Callum’s caravan was advertised through the PAMIS social media and by family support directors. We operated a first come first serve basis but family support directors were able to identify those requiring priority. This was a first for PAMIS and a very steep learning curve. The project has enabled us to develop skills and knowledge in setting up and running a PAMIS breaks programme. The budget provided the core costs for the running of the caravan. We raised funds for additional resources e.g. the high low bed, specialist shower chair, mobile hoist etc. We spent time developing relationships with key staff who were very empathetic with the group of people we were supporting to go on holiday. Priority areas of choice and control, outreach and joint working, all three were addressed. 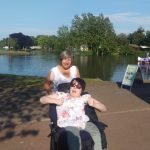 The people who accessed the breaks face many challenges in accessing holidays the equipment and accessibility, funding, flexibility in length of stay. We were able to offer the appropriate equipment identified by family carers themselves, flexibility in length of stay and cost and through working with the staff at Haggerstone an opportunity to a supportive environment. The park is open for a shorter period than anticipated and so less breaks were available. The caravan did not meet the expectations of some families, it is “well loved” A refurbishment programme is underway for next season. Not sure where to start! This has been a really steep learning curve for us and it started from the moment we had the interview form the Creative Breaks assessor. That was enlightening and assisted us in being more realistic in what we thought we could achieve. We realised fairly early on in the project that we required a consistent member of staff to manage and develop it. Initially no one person had full capacity so it became several peoples job and this was definitely not the best way to deliver. We have evolved, developed skills and knowledge within the team and have a dedicated team with specific roles to deliver on the project. This and our forms, booking process and a business plan means we are now ready for the next season. We developed great relationships with other organisations who supported us both with advice but also through some of the teething issues. Downs Syndrome Scotland were fantastic in sharing their resources and experience. They too had had an older caravan and some complaints and have advised that once we refurbish for next season this will be resolved. Haggerstone Castle staff have supported our learning and this year we will be draining down when prompted so there are no burst pipes following a cold snap! We learnt that we need to manage expectations and are preparing very detailed brochures of what to expect – a video walk through should support families in understanding what they will be coming to and enable them to make decisions about whether this is the right resource for them. The creative breaks funding has enabled us to venture into a completely new area of family support. We have developed our business plan in order to make this viable in the future and it has also attracted new funding in the form of an additional property and now a legacy to support PAMIS breaks. We have also had an opportunity to engage with new families from areas that we are currently not running services in. Fundraising for a project like this is easier than fundraising for family support service and so this is contributing to our fundraising strategy and raising the profile of our organisation. We have certainly developed skills and knowledge in lots of areas including caravan maintenance! However this also meant that we attracted new volunteers. The additional funding we have now attracted also means we can have dedicated staff to support the project, I guess I learnt that sometimes we are overstretching ourselves and this year has required a lot of additional volunteering time. We certainly benefited from the initial interview from the better breaks assessor but perhaps have only now realised the learning. 40 families and people with PMLD will have taken part in a short break and used the accessible park facilities. We provided 22 short breaks for 22 people with profound and multiple learning difficulties and 46 family carers/members. In addition 3 family carers had respite at home while their son or daughter was at Callum’s Caravan with paid carers. This was less than anticipated partly due to the shorter opening time of the park but also because the caravan was “much loved” and did not meet expectations of some families. The park provided a range of activities that were affordable and accessible for the families. The swimming pool had some issues with equipment which meant not all families were able to access it at all times. One mum, whose son is lucky to sleep for an hour each night, had a really positive experience there. Her son loves Haven Holiday Parks and the characters so he was really excited to go. Once there, quickly settled into a routine of swimming, relaxing and partying and slept for a full 10 hours minimum each of the nights he was there! Mum commented on the helpfulness of the Haven staff, they lifted her son’s wheelchair onto the dance floor each night, reserved a table for her at the dance floor and brought drinks to her table rather than her having to stand at the bar leaving her son (she visited on her own with him). The cost of the hire was of significant benefit to this family, they have been experiencing difficulties in the home situation where finances have been a considerable problem. If we didn’t have the caravan at such a reduced cost, this family wouldn’t have been able to go away. They have booked in to return soon. Carers will have accessed the short break and had an opportunity to have private and social time out with their caring role. Most of the family carers went away with their relative however there were 3 family carers who were able to have time at home out with the caring role. There was not the budget to provide volunteers at Haggerstone Castle as had been planned originally however through developing relationships with the staff at the holiday village support and empathy was provided to the families. The case study above also highlights this. One of the family support directors recognised on a home visit that the family was exhausted and they commented that all they wanted was to have a wee break away in a caravan. The director was able to phone head office, check availability and the family were in the caravan that weekend. They had a great time and everyone was able to relax and enjoy being on holiday knowing that they weren’t too far away from home. This family are on low income and struggle to have a proper break, this was the first holiday they had had in nearly 10 years. They were incredibly thankful for the experience. Carers are more relaxed, have reduced stress levels and more able to support the person they care for. The case studies highlight that for many families this was the case however the caravan did not meet the expectations of some families and there were some issues we had to address maintenance that did not support a stress free time. For some families this was the first opportunity they had had in a number of years to have time away with the whole family. The willingness of the staff at the holiday village to support for example single parents made the holiday relaxing. this mum also had an opportunity to sleep because her son slept through the whole night. The fabulous weather this summer also supported a relaxing time. Another family have benefited significantly from the reduced cost of the caravan hire. Mum and Dad both work but are on low incomes, they usually need to wait to find out if they have been allocated a Take A Break Scotland Grant before booking a holiday (usually meaning it’s a last minute thing). They were able to book our caravan well in advance so knew exactly where they were going and when. The flexibility of the caravan space worked really well for them as their son often wants to sleep beside either mum or dad. They had a great time there and felt safe in the booking as it was done through us. The ability to provide a short break provided support to the family support directors at PAMIS. They are usually working with families in great need and at times of stress. Having the ability to support a family in crisis reduced their stress levels and enhanced their job satisfaction. "As a family we were at breaking point...this break brought us all closer together and enabled us to have fun as a family and enjoy different surroundings. I can't thank you enough...for making this happen for us."